Schnauzers (meaning ‘small beard’ in German) are named after an actual dog, ‘Schnauzer’ who lived in Germany in the 1870’s, but the breed itself existed as far back as the Middle Ages. This is evidenced by various sculptures and Rembrandt paintings. Early Schnauzers were likely derived by crossing gray spitzes with black poodles. This resulted in an adept rat hunter and guardian that became incredibly popular by the early 1900’s, due in part to its distinct appearance. Standard Schnauzers (or ‘Mittelschnauzers’) became popular in World War I by serving as messengers and police dogs, and increased in popularity as a pet after World War II. The Giant Schnauzer (or ‘Riesenschnauzer’) was bred in Bavaria and Württemberg, Germany, in the late 1800’s by cattlemen who sought to make a version suitable for cattle herding. They crossed the Schnauzer with the Great Dane and rough-haired Sheepdogs. Giant Schnauzers were great cattle herders and became popular guard dogs and police dogs in Germany. The Giant Schnauzer has a shoulder height of 58-69 cm (23-27 in) and weighs 29-41 kg (65-90 lbs). The Giant Schnauzer has a long, rectangular head with small, deep eyes and highly set ears which may be cropped or uncropped. Giant Schnauzers have a flat back, highly set, erect tail, and small, round ‘cat feet’. The Giant Schnauzer has a soft, thick undercoat and a rugged, wiry outer coat which is solid black or salt-and-pepper colored. The coat is longer on the chin and face, forming eyebrows and a beard. The Giant Schnauzer sheds little. The Giant Schnauzer is even-tempered and an eager, intelligent learner. It is brave and fun, making and an excellent companion. Giant Schnauzers also make fine guard dogs as they are loyal, protective, and alert. At times, they may be pushy if they don’t know who’s boss. The Giant Schnauzer is even-tempered and an eager, intelligent learner. It is brave and fun, making and an excellent companion. Giant Schnauzers also make fine guard dogs as they are loyal, protective, and alert. At times, they may be pushy if they don’t know who’s boss. The Giant Schnauzer gets along great with familiar children, dogs, and other pets, but it is wary and cautious with people and animals it does not know. Giant Schnauzers are best behaved when given sufficient exercise and human companionship. The Giant Schnauzer may be too energetic to play with young children unsupervised. You can find Giant Schnauzer puppies priced from $800 USD to $3000 USD with one of our credible breeders. Browse through our breeder's listings and find your perfect puppy at the perfect price. The Giant Schnauzer gets along great with familiar children, dogs, and other pets, but it is wary and cautious with people and animals it does not know. Giant Schnauzers are best behaved when given sufficient exercise and human companionship. The Giant Schnauzer may be too energetic to play with young children unsupervised. The Giant Schnauzer requires weekly combing and biannual grooming/shaping. Typically, pet Giant Schnauzers are clipped and show dogs are stripped (dead hair is plucked via a serrated knife edge). Excessive hair around the pads of the feet should be removed and the ears must be kept clean. 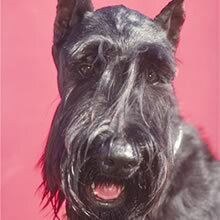 Giant Schnauzers with cropped ears should be checked for ear infections. Long facial hair should be combed occasionally. Giant Schnauzers can live outdoors in moderate or warm areas, but prefer to live indoors with plenty of playtime outdoors. Giant Schnauzers are prone to cancer and bloat; meals should be spaced out throughout the day. Giant Schnauzers have a long life span of 13-15 years or more. Though the Giant Schnauzer learns fast, it has a slight stubborn streak. Training must be fair and consistent and should not be overly repetitious. Giant Schnauzers are responsive to the sound of their handler's voice. They are versatile, and can learn a variety of activities such as hunting, retrieving, and herding. Giant Schnauzers require a lot of exercise, including daily walks and vigorous playtime in the yard. They can live in an apartment provided they are exercised sufficiently. Giant Schnauzer Puppies for Sale - Shipped Worldwide! Finding the right Giant Schnauzer puppy can be dog gone hard work. PuppyFind® provides a convenient and efficient means of selecting and purchasing the perfect Giant Schnauzer puppy (or Giant Schnauzer puppies) from the comfort of your home, 24 hours a day, 7 days a week. Take advantage of our PuppySearch or leisurely browse our directory of hundreds of dog breeds, Giant Schnauzer dog breeders, Giant Schnauzer dogs for adoption, and Giant Schnauzer puppy for sale listings with photos and detailed descriptions. Some Giant Schnauzer puppies for sale may be shipped Worldwide and include crate and veterinarian checkup. Many Giant Schnauzer dog breeders with puppies for sale also offer a health guarantee. With thousands of Giant Schnauzer puppies for sale and hundreds of Giant Schnauzer dog breeders, you're sure to find the perfect Giant Schnauzer puppy.